Scuba Diving and Liveaboards Phuket, Thailand » Blog Archive » PhiPhi Live-Aboard Dive Trip September 2012 on the Scuba Adventure. PhiPhi Live-Aboard Dive Trip September 2012 on the Scuba Adventure. Due to more erratic weather during the low seasons here (it can be blue sky and calm/clear seas or it can be raining and rough) live-aboard trips are better planned for the more local dive sites around Phuket, where shelter is easily found and diving schedules are much less affected. 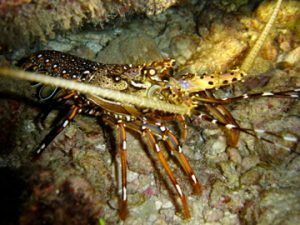 Rather than taking day trips, the local dive sites are so much better done from a relaxed live-aboard, with long surface intervals and schedules that best to avoid other divers on the day boats – all in all, much better diving! Shark Point 1 – Stronger currents occur twice a month, so it was nice to have a leisurely 1st checkout dive that enabled us to explore most of pinnacle #1. A mass of anemones, colourful soft coral, sea-fans and barrel sponges make this marine-life rich dive site a must on any trip. 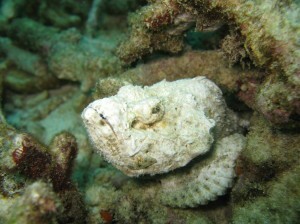 Always cool things to see, we managed to find 4 tiger-tail sea-horses of various shades and a nice variety of morays. Palong Wall Bay (Phi Phi Le) – We chose this dive site partly to avoid the currents on the other side of the island but also because it’s one of the best places to see black-tip reef sharks. Vis at about 10m was lower than Shark Point but once you tuned into looking for the sharks, it was easy to see them (some very close). There were individuals to be spotted throughout the whole dive and some groups of 3 or 4 sharks at a time. There were a couple of turtles munching on the hard corals and things like a white devil-scorpion-fish to entertain us as we waited for more big fish! Turtle Bay (Phi Phi Le) – As it suggests, this was our dive site for turtles. 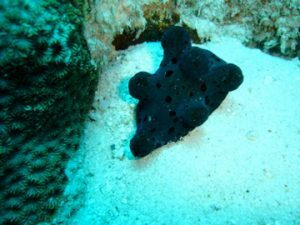 It didn’t disappoint with our divers seeing a combined 5 hawksbill’s of various sizes.This site can also be awesome for macro, with some colourful nudibranchs and we found a Maldive sponge-snail too. 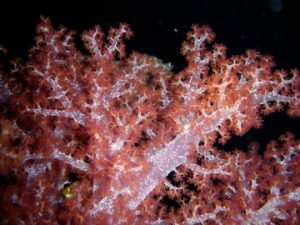 Tonsai Cave (Phi Phi Don) – As it suggests, this site has a cave but it was the wall, covered with coloured soft-corals and polyps, that was the subject of our night dive. Active with shrimp and decorator-crabs it was a green/grey, free-swimming, barred moray trying to eat a small crab that provided the best entertainment (the crab got away!). We had a bar-tailed moray, another interesting, though un-identifiable, small moray poking it’s nose around and also a nice beige tiger-tail sea-horse. 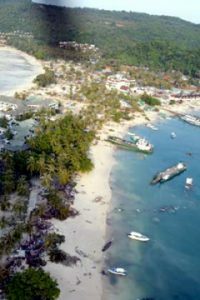 Koh Bida Nok – Again making use of the moderate current, we took drift down the longer side of Bida Nok. Always active with large schooling fish, we also had a few black-tip sharks and 3 very large ‘pick-handle’ barracudas. The terrain on the west side is varied and interesting, followed by a purple and yellow wall (complete with split level cave) on the northern end. 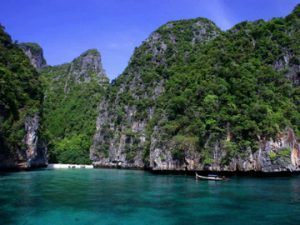 Palong Wall North (Phi Phi Le) – Getting another dive in on the east of Phi Phi Le really paid off. With the best vis of the trip (a clear, blue 30m), lighting up the stunning beauty of this site. Clusters of jagged rocks in the shallows, forming channels and swim thrus (with a few sharks and turtles), dropping down to the white sands at depth, that slope up and down to the large, soft-coral covered boulders. 2 big, playful cobia in the depths were the stars of this show plus a handful of squid and some good size spiny lobsters kept our safety stop swim interesting. Viking Cave North (Phi Phi Le) – We were also running some specialty courses on the boat, so this site was ideal for both a course dive and spending a bit more time in the shallows (4th dive of the day). We had a leopard flounder and a white bent-stick pipe fish in the mid-depth sands, another turtle at the dives end, but it was diving real slow and finding lots of nudi’s that made a nice contrast to the days ‘landscape’ diving. Nudi’s included; some small blue-dragons (Pteraeolidia Ianthina), a large Halgerda Stricklandi (bright orange spots on a bumpy white body with black-frilled on white rhinophores and gills – if that helps you imagine?) and lots of small but oh so pretty Flabellina Exoptata with their bright orange tipped, deep-purple ringed cerata (lots of pointed tubes down their back) on a violet body. Have fun looking them up! King Cruiser Wreck – With such an abundance of marine life it’s often hard to see this 80m long, 25m wide wreck! During the day, vis can be anything from 3m to 30m here, but there is nothing like an early morning dive at the cruiser. Vis is often at it’s best and you’re normally the only divers there. 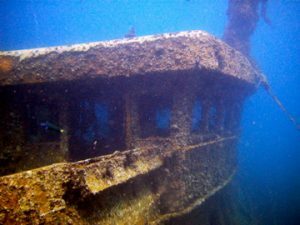 It’s absolutely the best way to enjoy the thousands of schooling fish and also the macro and soft corals that have grown on this rusty wreck. Shark Point 3 & 2 – Due to this time having the strongest of the currents during our trip, we decided to use pinnacle #3 of Shark Point as our focus for this dive, giving us protection from the in-coming tide and then a nice drift over to the vivid soft corals of pinnacle 2. Pinnacle 3, being a little deeper on average than the others, has more varied hard corals amongst the soft and attracts an awful lot of fish. A school of chevron-barracudas added yet another thing to our list of cool critters. 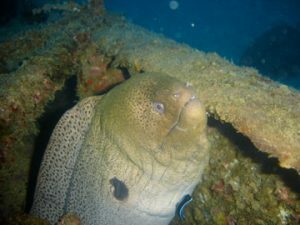 Koh Doc Mai – This was a great easy dive to finish the trip with. Vis was around 15-20m and we decided to make the most of the sunshine and visit the deeper rocks on the west side. Lots of nooks and crannies to find grey-bamboo sharks in and coral covered crests to peer over, then finishing off on the south wall for more macro and morays. Summary: Some mixed diving in terms of conditions (currents, waves, sunshine and light rain), with visibility a good average (min of 10m, max of 30m) and many fewer dive boats than high-season. Great diving, be it special critters to see on a dive, marine-life rich seascapes or a wreck all to ourselves. Diving with a small group of people, on a live-aboard during the low season has a lot of advantages to having a great time below and above the water – we had the opportunity to visit Phi Phi for an evening out too! Thank you to Vincent Moy who was Tour Leader on MV Scuba Adventure for this trip. 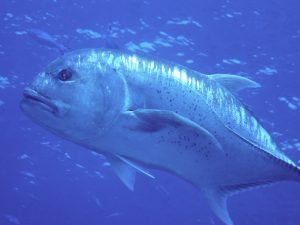 This entry was posted on Friday, November 9th, 2012 at 1:39 pm	and is filed under Liveaboards. You can follow any responses to this entry through the RSS 2.0 feed. Both comments and pings are currently closed.